The Education Minister Lindita Nikolla announced today that the Albanian Government will resign from the previous decision, which foresees additional fees for backlogs. She made this announcement because for the second consecutive day students from Tirana's public universities gathered in front of her office to protest precisely for this fee, which foresees a payment of 670 lek for each point for the backlog subjects. 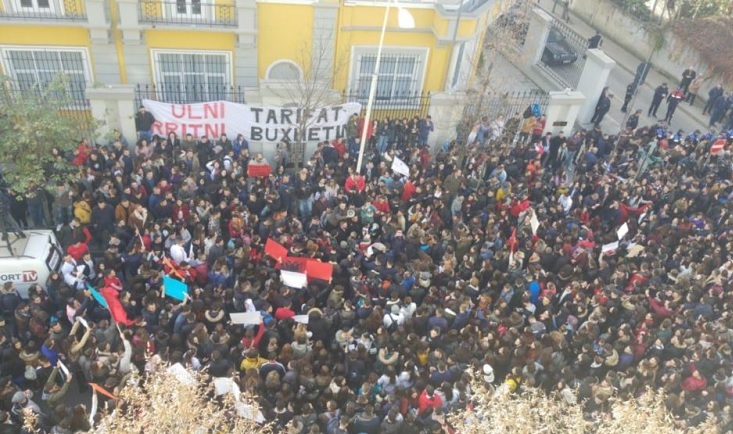 The youth of the universities of Durres, Korça, Elbasan and Shkodra Faculty of Law also joined the protest of the Tirana University students. This is the second day of protest, while today the number of students was higher. The reaction came after yesterday's statement of the Minister of Education, according to which the May 2018 Government Decision will be applied next year, and it was taken at the request of the universities themselves, to demotivate the backlog. She said the time is enough to discuss this issue, and the government is ready to review it. While Prime Minister Edi Rama, through a post in Twitter, announced that Minister Nikolla has suggested to universities to consider the revision of the Government's decision. The decision announced today for the abolition of this tariff did not stop the protest before the Ministry of Education. Students also ask for "halving the study fee, improving the dormitory conditions, as well as representing them with one member at the faculty management boards". Regarding the halving of the tariff, Mrs. Nikolla explained that this is a decision taken by the Universities, and stated that according to her in no country the students are represented in the boards of administration. Regarding the conditions in dormitories, she considered the claim fairly, explaining however that the government year after year is investing on this issue. President Ilir Meta, who "calls on the authorities and responsible institutions to demonstrate the appropriate sensitivity and responsibility in addressing the concerns of students in accordance with the legal framework and the spirit of dialogue for a solution as fast and fair as possible in the best public interest," is writen in the reaction of the Presidency. "The youth is our most precious national asset, so taking care of their concerns and aspirations should be a priority for all, especially the institutions." says among other things the President Meta.